JEMS® is about joy. Joy is what we are left with when we are not fearful about our bodies, and we rediscover the experience of wonder and exploration through movement. The world of sports science and sports medicine can sometimes lose sight of the human within the athlete. Joanne’s approach to unraveling movement barriers blends biomechanics and force management with neurology, sensory connection and self awareness, but also accounts for the environmental stresses and belief systems which influence an athlete. 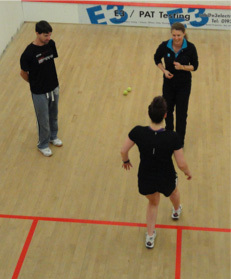 An internationally recognised lecturer on movement efficacy, injury prevention, rehabilitation and performance movement, Joanne has been Head of Performance Movement for the British Olympic Association, a presenter for the Swedish Sports Confederation, and an advisor and educator to many organisations including British Triathlon, the Royal Yachting Association of Great Britain, the FA (Football Association), England Badminton and the British Canoe Union. At elite level, Joanne has worked with sports including Professional Football, Rugby, Sailing, Golf, Tennis, Badminton, Triathlon, Skiing (Alpine and Cross Country), Kayak and Canoe, Swimming, Weight lifting, Track and Field, Cycling, Netball, Karate, Squash, Rowing, Judo, Equestrian and Biathlon. Joanne’s sporting clients include medallists in World Championships, Olympics and Commonwealth Games, as well as Ryder Cup, Walker Cup and European Tournament golf championship winners. A former coach herself, Joanne has one foot planted in the medical and the other in the training aspect of athlete management and development. This gives her a unique understanding of the challenges in sport from both perspectives, and an ability to build bridges between the two areas in her teaching, writing and consultancy. Joanne has a particular interest in child development in sport, and has designed physical preparation programmes for the Royal Yachting Association, Welsh Lawn Tennis Association, British Canoe World Class Start programme, Welsh Netball and Welsh Sports Acrobatics. 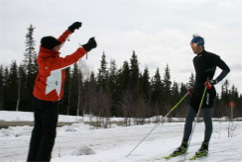 She created a DVD on child movement development for SISU Idrottsbocker, the publishing division of the Swedish Sports Confederation, which has subsequently been translated into Norwegian. Joanne’s detailed approach to movement expression from a holistic standpoint has led her to naturally develop her work with dancers and musicians. For ten years she has been a consultant to the National Dance Company of Wales on dancer development, individual dancer performance, mentoring and organisational dynamics. Her dance clients also include Ballet Cymru, and Joanne was an external tutor for the London Contemporary Dance School. 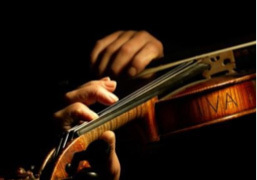 Joanne’s musical clients include musicians from the BBC National Orchestra of Wales, Welsh National Opera, and a number of international soloists. 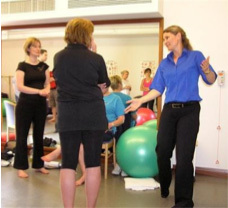 After identifying a spiraling injury rate amongst young musicians, Joanne and her husband, fellow physiotherapist Kent Fyrth, successfully secured support for injured music students from the Musician’s Benevolent Fund, and implemented an injury prevention educational lecture series which has run successfully at the Royal Welsh College of Music and Drama since 2005. Kent and Joanne have also delivered these lectures at the Victorian College of the Arts in Melbourne, Australia. Diversity has been the hallmark of Joanne’s clinical practice, but her particular field of interest has been with people of all ages struggling with chronic or recurrent barriers to recovery or performance. Joanne’s interests in functional and behavioural influences on the body, along with her love of neurology and psychology have led her to accumulate an unusual breadth of patient experiences which have contributed to the development of her approach. Working with children is a particular pleasure for Joanne, and most of these patients present with chronic musculoskeletal problems. Some of these are due to hypermobility, but many have a constellation of subclinical signs such as global low tone, incoordination or focal control issues, which require a structured neuromuscular approach. JEMS® is the result of a life long collaboration between myself and my own body, and with the clients and patients who have inspired me, challenged me, and through their stories and experiences, have been my best teachers. Joanne has been developing her concept for twenty five years, and has been teaching rehabilitation professionals, coaches and health and fitness professionals intensively since arriving in Europe in the mid ‘90s. She is passionate about sharing her love of movement and the fascinating process of engaging patients in their own recovery, teaching a methodology which is enjoyable and stimulating for patients and therapists. Joanne’s former students have applied her techniques in diverse settings, continuing to explore and reason critically, relevantly and creatively. They have taken her concepts into hospitals in intensive care, falls prevention, rheumatology, neurology and orthopaedics, into the community for learning disabilities, schools and eating disorder clinics, into the occupational arena, the military, the elite sporting world and onto the stage.